On Monday August 21, 2017, while the nation was transfixed by the first total solar eclipse in 26 years, the Carrion brothers, Michael and Patrick, were busy celebrating 75 years of priesthood with clergy and religious from throughout the Archdiocese of Baltimore. Brothers Fr. Michael Roach and Fr. 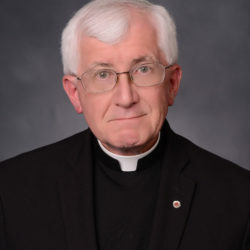 Thomas Roach, S.J. If the celebration was an indication of anything, it is that vocations grow on trees—family trees. Fr. Michael and Fr. Patrick aren’t the only priestly or religious vocations in their immediate family. Each of their parents has an aunt who was a religious sister; Sister Mary of the Divine Heart, R.G.S, and Sr. Mary Bernardella, S.S.N.D. Their uncle Fr. Martin Flahavan was a priest of the Archdiocese of Baltimore and a frequent family visitor. “He came to the house a lot, and he was always ‘uncle Martin,’ not, ‘Father Flahavan.’ Being a priest, to us, was something normal, something basic. It was just a part of growing up,” Fr. Patrick said. 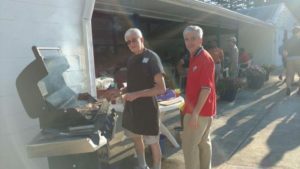 Michael, Patrick, and their brother Timothy were all altar servers growing up in a devout Catholic household with parents Walter and Helen, but Fr. Michael’s path to the priesthood was sudden. He hadn’t considered it until he was about to graduate from high school, then almost suddenly made the decision to enter college seminary. Fr. Patrick’s discernment process was almost exactly opposite his brother’s. 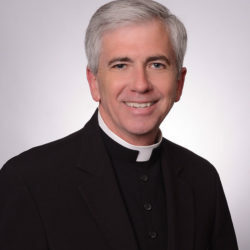 His first recollection of considering the priesthood came when he was seven years old, but, though the desire for the priesthood was there, he chose to go to the University of Maryland. After graduating, he considered pursuing a Masters in Public Health. But that was when he finally decided to enter seminary. He went home to tell his parents, whose reaction was surprising—at least to him. While Patrick was in seminary, having a brother who was a priest—Fr. Michael was ordained in 1977, five years before Fr. Patrick’s ordination—came in handy. 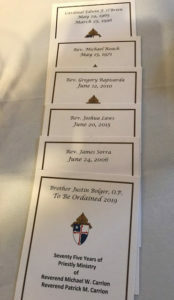 To this day, they continue to be “brother priests” in every sense of the phrase.